Do you want to know the secrets of how to accessorize with style? The Finishing Touch: perfecting the art of accessorizing is over 100 pages of useful and easy to apply information on how to add style to your outfits with accessories. Perfect the art of accessorising today! This fully illustrated eBook contains loads of colour pictures to help you choose the accessories that suit your body shape, flatter you, and work with your outfits. 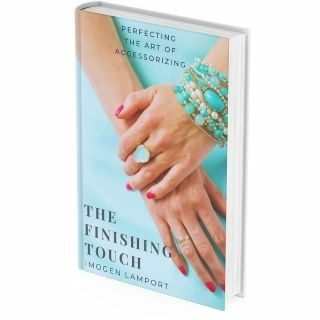 Watch a short video about the contents of The Finishing Touch. I was thrilled to receive the new e-book from Imogen Lamport, a colleague from Melbourne who is a total inspiration. Entitled The Finishing Touch, it’s the book I wish I’d written – and I can’t say more than that. Focusing on accessories, Imogen demonstrates how we can use them to give any outfit ( from the truly casual to the extremely elegant) that ‘je ne sais quoi’. As it’s chock full of explanatory photo’s it’s really easy to follow and so well explained that I might just be out of a job!! It’s very comprehensive, covering everything you’re ever likely to need and other things you never even thought about. Combining traditional expertise with up to date clothing and text with graphics means that every learning style is covered and every style personality too. A ‘must-have’ e-book that you’ll use time and time again and I’ll bet it will never let you down. It’s a style guide that no-one should be without. The Finishing Touch is like a written down session with Imogen, there’s heaps of useful information about different types and sizes of accessories to choose, how to pull together ‘a look’ and why certain styles work well together. I find Imogen’s thoughts on scale & placement of accessories to be particularly helpful. I used to be too scared to wear accessories in case they weren’t right for me, or I’d wear things that clearly didn’t work – now I can accessorise with confidence!